Gandhara University is one of the leading universities in the region which serves the nation in best possible. It is registered with Pakistan Medical and Dental Council and maintained an excellent academic record for a long period of time. Today, Gandhara University announced admissions for the session of 2019-20 in different categories which are listed under. Department of Postgraduate dental sciences Sardar Begum Dental College Peshawar invited applications for the following programs. These admissions are advertised in daily Aaj dated 22-03-2019. 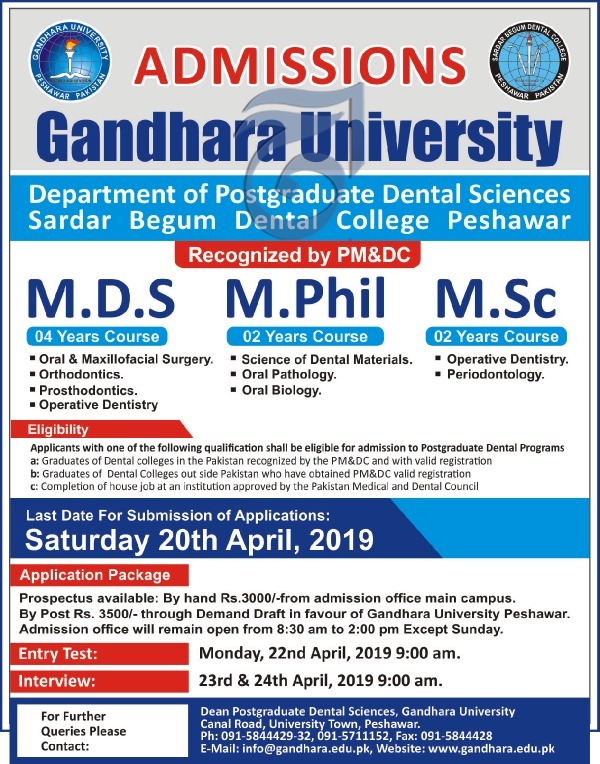 Sardar Begum Dental College Peshawar Offering admissions in MDS, M.Phil and M.Sc. Complete details are given below one by one. Applications with one of the following qualifications shall be eligible for admission to the postgraduate dental program. 1) Graduates of dental colleges in Pakistan recognised by PM&DC and with valid registration. 2) Graduates of dental colleges outside Pakistan with valid PM&DC registration. 3) Completion of house jobs at an institution approved by PM&DC. The last date for the submission of forms is 20th April 2019. You can get prospectus by hand from the admission office as well as by post. However, getting prospectus by post will charge RS 500/- additionally. Prospectus by post: R.S 3500/- through demand draft in favour of Gandhara University Peshawar. The admission office will remain open from 8:30 AM to 2:00 PM except for Sunday. For any kind of queries kindly visit the main office located on Canal Road, University Town Peshawar. The last date for the submission of form is 22-04-2019. For your information, the original advertisement is given below. Note: These admissions has advertised on Friday in daily Aaj Newspaper Peshawar Edition.